This report is based on a task order titled Developmental Needs of Children Investigated by Child Protective Services conducted by the Institute for Social and Economic Development (ISED), under contract number 233-03-0099, for the Office of the Assistant Secretary for Planning and Evaluation, U.S. Department of Health and Human Services. 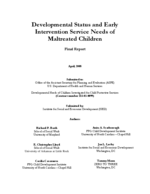 The opinions expressed in this paper are those of the authors and do not necessarily represent positions of the U.S. Department of Health and Human Services, Office of the Assistant Secretary for Planning and Evaluation. Barth, R. P., Scarborough, A., Lloyd, E. C., Losby, J., Casanueva, C., & Mann, T. (2007). Developmental Status and Early Intervention Service Needs of Maltreated Children. Washington, DC: U.S. Department of Health and Human Services, Office of the Assistant Secretary for Planning and Evaluation.